Book Review: Hug It Out! Charity stitching is something close to my heart, so when I had the opportunity to review Hug it Out by none other than the CGOA's very own Crochet Dude, I jumped at the chance. I personally crochet and donate many items a year locally and am always looking for unique new ideas for objects to create. And Drew's book through Leisure Arts does just that! Whether you are looking for a stash-busting Kennel Blanket to donate to your local animal shelter or if you are in need of a unique cap for a friend fighting cancer and starting chemo, Drew Emborsky's book has a design for you! My favorites include the Baby Comfort Blanket and Baby Hat which any premature newborn would love to snuggle in. Plus the Mobius Cowl is a wonderful idea for anyone with mobility challenges. And what scared little child would not adore a Comfort Teddy when sirens come blaring to an accident or crime scene! This book features nine beautiful designs perfect for giving and range from beginner to intermediate in skill level. Most designs use basic stitches and easy finishing techniques too. 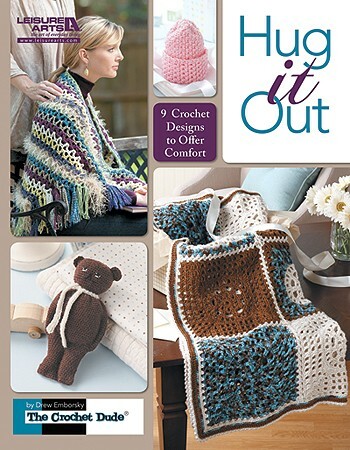 Hug it Out offers excellent ideas for many different charitable opportunities, and if you don't have a specific charity that you donate to, the book offers a list of national organizations which are all willing to accept your handmade goodies. And of course, the book also includes your standard general instructions with abbreviations and yarn information. While reviewing this book, I quickly whipped up a Kennel Blanket to donate to my local no-kill animal shelter. I selected this design for many reasons. First, it is a GREAT stash buster and like many of you, I have a huge stash! Second, my daughter and I usually spend part of our Fridays at our shelter walking and playing with the dogs, but over the last few months our time there has been nil because of our own dog being ill and needing constant care. And my third reason for choosing this design was the opportunity to try a new-to-me stitch called the linked double crochet. The blanket came out beautifully, I loved the new stitch, and I can't wait to see some sweet little dog snuggled in my blanket the next time we are there. Full disclosure: A free review copy of Hug It Out! was provided by Leisure Arts, Inc. Although I accept free products for review, I do not accept additional compensation, nor do I guarantee a positive review. My reviews are based entirely on my honest opinions. Please check your Chain Link newsletter in the current issue of Crochet! magazine for the Board of Directors Election Ballot. If you have not received your issue soon, it should arrive shortly. The mailings began last week. To say this isn't your ordinary book would be an understatement. Renee started on an adventure in November 2011, challenging herself to design, create and write patterns for 12 beautiful crochet lace shawls. Her challenge to herself was to create one each month and she has really out-done herself with these jewels. Now, I'm not a shawl person. Wearing a shawl never seemed to fit into my lifestyle. But, I discovered that you don't necessarily have to wear a shawl in traditional fashion. You can wear it in more creative ways. I have found that I love to wear a shawl as a scarf, draping down with the points in the front. 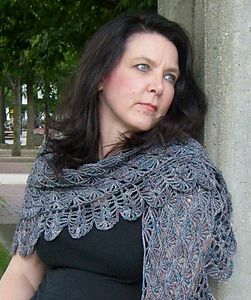 I also love to wear a triangular shawl, with the center point in the front and the ends hanging around the shoulders. It's so easy to change your look and attitude with a gorgeous shawl. And, with just the right wrapping and just the right shawl pin, a shawl can even be transformed into what appears to be a garment! I've seen them draped and pinned to look like a vest or a poncho, with one side left open at the shoulder. Now that I've discovered that even a non-shawl person like myself can wear shawls, I really enjoy making them. It's my answer to that doily challenge that lives deep down in my crochet soul. I love doilies. They challenge my skills and are fun to make. But, you can only have so many doilies. I love them and I know so many of you do as well. A lace shawl is my answer to my doily desires. And, that's why I know you're going to love this e-book from Renee Rodgers. You'll be able to download all the PDFs for the year and you can even send the patterns to your e-reader and take them on-the-go. You can purchase the patterns individually or altogether as one, your choice! Patterns, a la carte! I love it. Because this is an e-book and the patterns are listed individually, there is no true book cover. The photo above is one that I chose because it's my favorite. 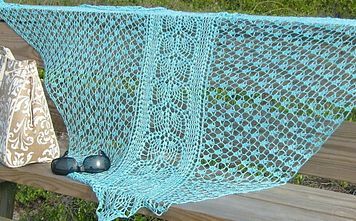 "Vilano Beach" is the May installment and is made in one of my favorite laceweight yarns, Ivy Brambles Silk. Just gorgeous. And, imagine my surprise when I was drooling over browsing through this e-book and one of the models is our CGOA President, Amy Shelton! Amy is modeling "Summer Storm", the July installment, made in MadelineTosh Merino Light. Isn't that stunning?! View all projects in this e-book at CrochetRenee.com. Full disclosure: A free review copy of 12 Shawls in 2012 was provided by CrochetRenee.com. Although I accept free products for review, I do not accept additional compensation, nor do I guarantee a positive review. My reviews are based entirely on my honest opinions. Tunisian crochet has been increasing in popularity for the past few years, and if you’ve been waiting to learn, now’s your chance! In the Ultimate Beginner's Guide to Tunisian Crochet, Kim Guzman walks you through the basics while offering nine projects of increasing difficulty. The book focuses on Tunisian crochet creations that mimic the look of hand knitting. The book includes an introduction to the types of hooks that are available for Tunisian crochet, as well as ways to modify standard or double-ended crochet hooks for Tunisian crochet. An eight-page section with step-by-step photos demonstrates the basic stitches including Tunisian simple, knit, purl, reverse, and extended stitches. This section is helpful even to a more experienced Tunisian crocheter because Tunisian crochet stitch names are not always standardized, and the pictures allow you to identify stitches you may already know, which may have been called a different name in prior publications. After introducing you to the stitches, Kim shares techniques for increasing, decreasing, changing colors, seaming and other finishing. The remainder of the book is devoted to the patterns, with a brief section at the end that includes information on reading patterns and the yarns used in the book. Kim writes in a conversational tone and reading this book is like having a great teacher looking over your shoulder. Some of my favorite features are that the book lays flat so you can read along while crocheting; projects list yarn by type rather than by brand for easy substitution (a list of yarns used for each project is provided at the end); and many pictures and illustrations demonstrate various techniques throughout the book. Kim assumes that you have at least some knowledge of standard crochet (i.e., how to make a chain) and familiarity with pattern-reading conventions. Ravelry members can view pictures of all the patterns in the book here. Kim will be hosting a TCAL (Tunisian Crochet-A-Long) for the Cabled Mitts starting November 15 in her Yahoo group. You can learn more about it here. Since Tunisian crochet cables can be challenging to even more experienced Tunisian crocheters, you may want to join in! This book would appeal to crocheters who want to learn Tunisian crochet, crocheters who want to explore different techniques, and Tunisian crocheters who are looking to expand their skills beyond the basic stitches. Project types: 2 vests, 2 scarves/cowls, 1 ruana, 1 hat, 1 blanket, 1 bag, and 1 pair of mitts. Skill levels: 1 Beginner project, 4 Easy projects, and 4 Intermediate projects. 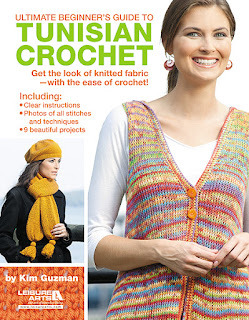 Full disclosure: A free review copy of Ultimate Beginner's Guide to Tunisian Crochet was provided by Leisure Arts Inc. Although I accept free products for review, I do not accept additional compensation, nor do I guarantee a positive review. My reviews are based entirely on my honest opinions. Now who doesn't love crochet tip books? I know I do! And is it possible to have too many? Definitely not in my house! 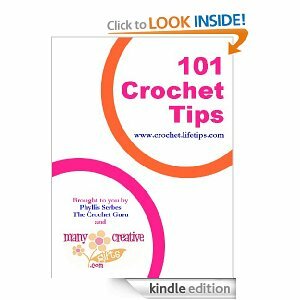 One of the newest tip books I've come across lately is 101 Crochet Tips by Phyllis Serbes. Some of you may know her from her company, Many Creative Gifts or even as the Crochet Guru over at Life Tips. I recently had the pleasure to review this all-inclusive book and can't wait to tell you more about it. The first thing you will notice is that this is no ordinary book, it's an e-book, and it is made especially for all Kindle users. But don't fret if you do not own a Kindle. Amazon offers a free reading application that you can download for use on your computer, making it possible to read Kindle books directly on your computer. That's what I did, and boy, was it worth it! I will admit, that it made me wish I had an e-reader. I can envision how nice it would be to throw this little item into my crochet tote along with my current project. It would be right there, at the perfect time, exactly when I need it. Plus all the tips are short and sweet. Such an easy read, especially when waiting in a doctor's office or waiting in line somewhere. This book features 48 pages of crochet goodies. It is broken down into eleven chapters that are sure to please. You'll find tips about the health benefits of crochet (did you know you can burn up to 400 calories crocheting for an afternoon?) to creative finishing techniques. (I never thought of putting my amigurumi stuffing into nylon hosiery before putting it into the crocheted item to keep the stuffing from popping out!) 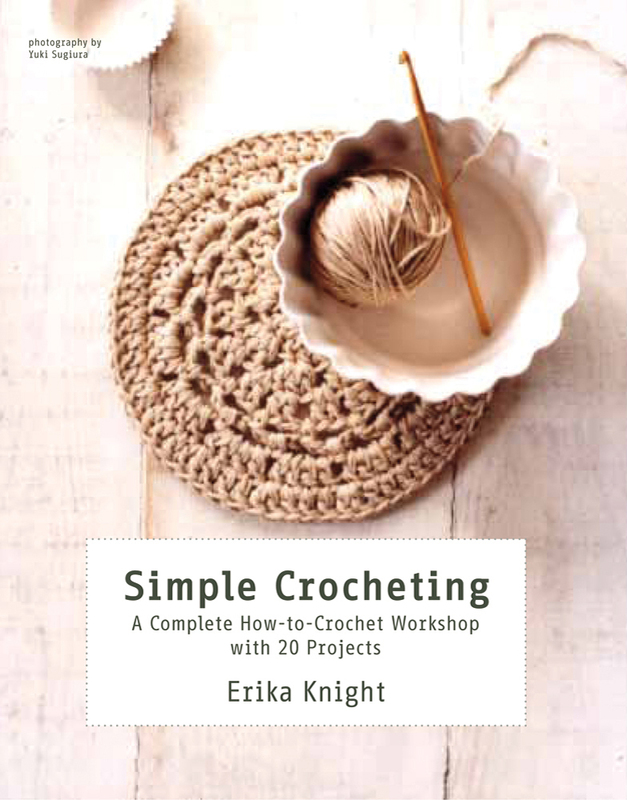 Other chapters include Crochet Resources, The Language of Crochet, and even a section on Good Projects for Beginners. 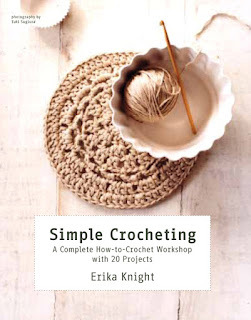 Although the book seems to focused towards a beginner crocheter, I think it would be a great addition to any crocheters library and I am in love with the fact that it is so conveniently found on your e-reader. I can only imagine how nice it would be to have it at hand any time you need it. Plus, I believe you can also read a lot of crochet patterns, books, and magazines on your e-reader, so you can easily keep this publication right next to your current pattern and WIP. Now, if only I could get my hands on a Kindle! Oh, Santa...I've been a very good little crocheter this year! Full disclosure: A free review copy of 101 Crochet Tips was provided by Phyllis Serbes. Although I accept free products for review, I do not accept additional compensation, nor do I guarantee a positive review. My reviews are based entirely on my honest opinions. If you are anything like me, the announcement that a friend or family member is having a baby makes my crochet hand twitch! But more recently, life has been so busy, that I have had difficulty finding the time to make my usual gorgeous baby blanket. Enter Crochet in a Day for Baby, by Candi Jensen. I have long been a fan of Candi’s designs, and her baby designs are no exception. Jensen has created 20 adorable, yet simple projects that any new mom would be happy to receive for her baby. There are pullovers, cardigans, vests, booties, washcloths, bibs, hats, mitts, and yes, blankets. There is even a pattern for a cute set of soft blocks and covered baby hangers, which would make a great pairing with one of the pullovers or cardigans. One of the things that I really appreciate about Jensen’s book is the fact that she gives good solid, basic patterns, and then customizes them with different colors and different stripe combinations. She encourages the reader to experiment and use their own design sensibility to make them their own. She has also included a good balance of designs that could be gifted for boys or girls. As a long-time crocheter of baby gifts, finding something for a baby boy can sometimes be a challenge. Jensen doesn’t suggest it, but I think that any of the combos of pullover/cardigan, hat, booties and bib, done in the same yarns and colors would make a nice custom layette. If there’s time, add one of the blankets or some matching covered hangers for a really special set. Or, if you’re more like me, and time is at a premium, and you only have one day, make any one of the projects and you’ll have a well-appreciated handcrafted gift for baby. Crochet in a Day for Baby is a great title for any crocheter’s collection, whether they are a beginner or more experienced. The concept of a book that focuses on projects that can be made in a day is a great one. In fact, I think I need to make the Pink and Ivory booties for a little girl who’s on her way. There’s a baby shower coming up soon! Full disclosure: A free review copy of Crochet in a Day for Baby was provided by Leisure Arts, Inc. Although I accept free products for review, I do not accept additional compensation, nor do I guarantee a positive review. My reviews are based entirely on my honest opinions. The CGOA Website Gets a Facelift! 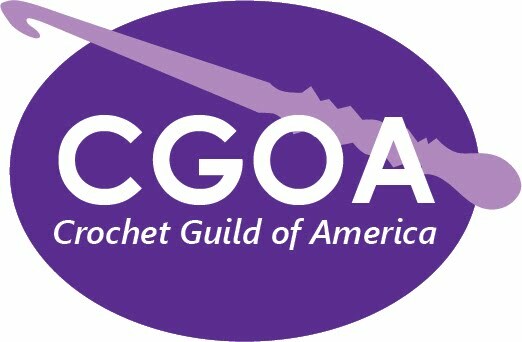 Check out the new look of the Crochet Guild of America's website here! The following dates have been announced for the Knit and Crochet Shows scheduled for 2013. Please visit the Knit and Crochet Show website here for more details as they are added. As we move towards the winter, crocheted snowflakes seem to be cropping up everywhere. 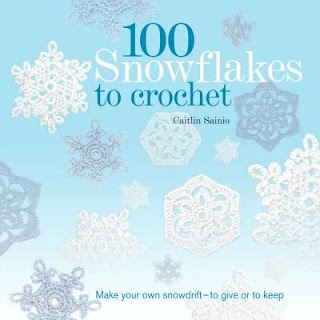 In 100 Snowflakes to Crochet, Caitlin shares snowflake basics, 100 fun patterns, and seven project ideas to get you started on a great snowflake project. The Basics chapter reviews materials, techniques for blocking and finishing, and pattern abbreviations and symbols, and provides an illustrated review of basic crochet stitches. For more advanced crocheters, Caitlin provides tips for designing your own snowflake patterns. The patterns are shown with both US pattern abbreviations and international stitch symbols, and are also arranged in order of difficulty. To keep the book visually interesting, the snowflake samples are made in several colors. The final chapter, Projects, includes pictures of seven projects made with the snowflake patterns in the book, along with a paragraph explaining how to assemble the project. This book would be a great fit for threadies, crocheters who enjoy motif patterns, and those looking for unique and beautiful winter holiday projects. If you are a thread crochet newbie, Caitlin provides some tips for getting comfortable with thread and starching in this interview. I’ve been motivated to dust off the steel hooks and start on a set of snowflake cards for the holiday season. Project types: 100 snowflake motif patterns, 5 home décor and 2 accessories projects. Skill levels: Not listed, but arranged in order of difficulty. Full disclosure: A free review copy of 100 Snowflakes to Crochet was provided by St. Martin's Press. Although I accept free products for review, I do not accept additional compensation, nor do I guarantee a positive review. My reviews are based entirely on my honest opinions. Catherine's patterns include the classic granny square, granny stripes, granny triangles, and several other motif variations. She uses bright, modern colors and a variety of yarn weights to achieve different looks. The book is organized by project type with a short Useful Information chapter at the end which includes written and illustrated instructions for all of the stitches and techniques included in the book. 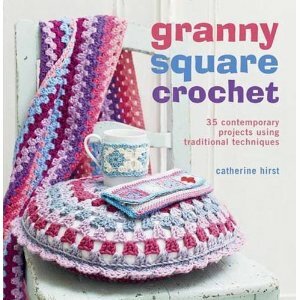 Although Granny Square Crochet includes some tips for making grannies, it is primarily a pattern collection, not a technique book, so you’re most likely to enjoy it if you love the projects inside. This book would be a good fit for granny chic lovers, crocheters who are moving beyond the basics, and those who like to work with stash yarn and colorwork. Project types: 15 home décor, 11 accessories, and 9 for babies and children. Full disclosure: A free review copy of Granny Square Crochet: 35 Contemporary Projects Using Traditional Techniques was provided by CICO Books. Although I accept free products for review, I do not accept additional compensation, nor do I guarantee a positive review. My reviews are based entirely on my honest opinions. The title of Knight’s latest book delivers what it promises. In Simple Crocheting, Knight strives to create a set of instructions which makes the art of crochet accessible to everyone. The author gives an excellent breakdown of yarns, hooks, gauge, project selection, pattern reading, abbreviations, and stitch formation. Each basic technique, from making a slip knot and holding the hook (with a brief nod to the lefties out there), to working all of the basic stitches, how many turning chains are needed when working back and forth as well as working in the round, are all described in good detail with step-by-step line drawings accompanying the written directions. Knight also provides this kind of detail when describing finishing and seaming. I especially like the basic stitch library included in the book. Knight has included all of the basic stitches for reinforcement, as well as a small selection of lace and textured stitches. With no more than two stitch patterns per page, each is provided with written as well as charted instructions, and a generously-sized photograph of a completed swatch with a little extra note on each with ideas for usage. In total, there are 16 different stitch patterns in the library, including 4 basic motifs. Nine of the projects are home décor, including three throws. The balance of the projects are fashion or fashion accessories, including a couple of jewelry projects. The only actual garment is Knight’s Asymmetrical Cardigan, which makes effective use of a super bulky weight yarn and an N-size hook to create a lacy cardi that reminds me a bit of a wearable flower garden. No doubt this garment would work up very quickly and be a cozy layering piece one could create with a definite instant gratification factor. Knight has also included projects that utilize yarns of all different weights, from laceweight to the super bulky and everything in between. She even includes a section on creating your own yarn from fabric strips. Two of the projects utilizing such yarn include a round rug and a pet bed. All of the projects in the book, if followed in order, would indeed lead a beginning crocheter step-by-step through the necessary skills needed to create successful crochet projects. By the end of the book, you would no longer be a beginner! Simple Crocheting is an excellent book for those who wish to begin crocheting, and some of the projects would even appeal to a more advanced crocheter as well. The photography in this book is very well done, as are the line drawings. I believe Simple Crocheting, along with a couple of skeins of yarn and a hook, would also make an excellent gift for anyone you might know who desires to learn to crochet. Full disclosure: A free review copy of Simple Crocheting was provided by St. Martin's Press. Although I accept free products for review, I do not accept additional compensation, nor do I guarantee a positive review. My reviews are based entirely on my honest opinions. our knit and crochet heritage." Remember when the Yarn Group decided to support Karen Kendrick-Hands and her work exploring the idea of a Knitting Heritage Museum? Well, the symposium is right around the corner! The event will be held in Madison, WI on November 8-10. Registration for the entire symposium has been capped at $175 for all three days' events with a terrific lineup of speakers, topics and activities. It is an exciting time to envision a totally unique museum, getting off to the right start. Come help us to develop a twenty-first century institution to honor an ancient fiber art. Here's a link where you can register to part of this wonderful project. Direct PDF to brochure here. If you have further questions, contact Karen at kdkhands@me.com. She has been working relentlessly on this and is full of great information! If there's one thing crocheters love, it's Yarn! Help celebrate the yarn we love and share your passion with the yarn arts on the official "I Love Yarn Day" brought to you by the Craft Yarn Council. I Love Yarn Day is scheduled for October 12. You can find more information on the website here where you'll also find free patterns for fun projects so you can join in the celebration and show your appreciation for the Yarn we all know and love! 1. Watch a short slide show of the 2012 Design Competition winners. If you missed the Manchester conference, you will definitely want to see up close pictures of the fabulous winning designs! 2. Chapter Challenge: Learn about the winners of this year's chapter challenge and be inspired to encourage your chapter to participate in next year's challenge. 3. Member Show and Tell: If the idea of walking down the catwalk during the fashion show on banquet night seems just a little scary, take advantage of this informal opportunity to share your favorite crochet project from this past year with other conference attendees. Bring your favorite finished project and be prepared to share your name, chapter affiliation (if any), name of the pattern and where others can find it, and the name of the yarn you used. 4. Gift Exchange (optional): Bring a crocheted item (maximum material cost $25) for a gift exchange. Go home with a special conference memory. 5. Q&A with President Amy Shelton: First, Amy wants to ask conference veterans to share their favorite part of attending a conference. Next, she wants to ask conference newbies what they're most looking forward to at their first conference. Finally, she'll open the floor for members to ask her any questions they have. If that doesn't get you all excited about the conference, we have one last activity to get that energy level pumped up: We'll leave the Kickoff Meeting and head right over to the Market Preview, where you can get a sneak peek at everything on the show floor. Be sure to bring your cash, checks, or debit/credit cards with you, as you will be able to make purchases that night. If we have enough time before the end of the Kickoff Meeting, Amy will even share some tips on how to make the best use of the Market Preview. Are you going to have a booth on the market floor at Chain Link in Reno? If so, please post a comment and let us know what crocheters will be able to find in your booth. If you know a vendor who will be exhibiting, please invite them to come post a comment. We hope you’ll come to Chain Link to take classes and participate in CGOA activities, but we also hope you’ll support our vendors on the show floor. Are you still deciding which classes to take at Reno? Pre-registration is open through August 27, so you have a little time left to make your final decisions and take advantage of the pre-registration discount on class prices. If you're interested in working with thread, I highly recommend taking one of the above classes that feature thread. While thread crochet uses all the same stitches as when working with yarn, there are some hints and tips that make it much easier to work on a smaller scale. It's really great to have a teacher right there to help as you learn new tensioning skills. Have you ever wanted custom buttons to perfectly match the garment you're making? I can't recommend Suzann Thompson's Polymer Clay class highly enough. I was lucky enough to take it in Greensboro last year, and I learned so much. Once you learn Suzann's tricks, it's very easy to quickly make your own custom buttons. Big Tip: Don't pack huge amounts of polymer clay in your carry-on baggage like I did (with 15 packs of clay). The plasticizers in it make it read as an EXPLOSIVE: not a good thing to take security, especially in the metal box I had mine in. Luckily, the TSA agents didn't confiscate it and let me take it on through. At least most of it was in its original packaging, thank goodness!) I did have some explaining to do, though! The Polish Star stitch is beautiful, but a little tricky when you're first learning how to make it. I took this class from Pauline Turner, and I know Susan will do just as wonderful a job walking you through the intricacies of this stitch. Marty's classes are excellent technique classes that will let you add new dimensions to your work, especially if you like experimenting and coming up with your own designs. Any of the classes listed above would be an excellent addition to your class list. Chain Link Reno: Dance Party Rescheduled! Are you all finalizing your plans to come to Chain Link in Reno next month? I know I'm getting very excited. It is going to be one fabulous conference! I hope you're able to come join us. Just wanted to give you a heads-up that the Dance Party has been rescheduled to Friday evening from 9 PM to midnight. Having the Dance Party on Thursday after classes, a CGOA Kickoff meeting, and the Market Preview, means that many people wouldn't get a chance to eat dinner that night. And while the party snacks are nice, they're not a substitute for a full meal. So to help make sure that our DJ (the incomparable Doris Chan! )and dance party sponsors don't faint dead away from lack of food and have to be tucked into a corner so people don't trample on them, we decided to move the Dance Party to Friday night. You'll have time for a quick dinner between 5:00 and 6:15, which is the start of the CGOA Mini Member Meeting. That meeting should be over by 6:45 or 7:00, so you'll again have time to squeeze in a quick meal if you're going to the Chapter event at 8:00. The Chapter event is scheduled from 8-9 PM, but might run over if there's a lot of good sharing taking place. Don't worry---you'll still have plenty of time to get to the Dance Party. I can guarantee the party will still be going strong when it's time to shut it down at midnight! So mark your calendars and plan on attending the Dance Party Friday night! What do you know? It's March again already, and that means it's National Crochet Month! Your CGOA Board of Directors invites you to help us celebrate! Let's have a month-long conversation and Crochet-Along right here on the blog. Do you plan on doing anything special in March to help promote awareness of just how awesome crochet is? Please post a comment and let us know your plans. Feel free to post links to your activities! Offer to create a crochet display at your local library. Expand your own crochet skills. Learn a new crochet stitch or technique. Experiment with a new yarn. Visit your local library to see what crochet books they have. Select a special charity to crochet for during March. Explore new charities you might like to crochet for. A good resource for finding charities is Lion Brand's Charity Connection. Attend a local crochet meeting. Join or start a local CGOA chapter. Strike up a conversation with someone you see shopping for yarn. You can break the ice by asking if they know March is National Crochet Month! Let's have a month-long party in celebration of National Crochet Month! We received this touching story via email directly from the author, and thought you might be interested in reading it. © 2012 Keith Horcasitas. All rights reserved. Reprinted with permission. 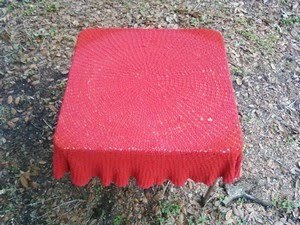 A short story about Melissa's crocheted table cloth gift for my wife, and how it continues to transform me - initially, in how to be a better listener and social worker and continually, in finding ways, like she did, to craft the fabric of life for God, myself and others. It was the first Sunday of the month, so we got ready to coordinate the donuts' ministry after the 9:15 AM Latin Mass at St. Agnes in Baton Rouge like we usually did. After picking up the donuts and getting to church before Mass, I set up the table outside to be ready for when the little (and big) kids would come running later for some sweet rewards for good behavior in church. The table cloth this time was different from the normal white covers we usually used - it was a beautiful crimson red crocheted circular shaped cover that fit neatly over the folding table; Maria must have put this in the supplies bag, since it was in January, technically still in the Christmas season (not in any way symbolizing my support for Saban's Alabama - for what was then the upcoming BCS game in New Orleans that LSU lost!). A rush of memories suddenly came over me as I recalled this table cloth, which I had commissioned Melissa to make many years ago for my sweetheart, Maria, before we were married. And with March being "National Social Work Month," I couldn't help but see how instrumental Melissa was with my development in the field. When I first met Melissa in the fall of 1981, I was unaccustomed to interacting with folks at nursing homes. So I was a little tentative in knowing what to say as a greeting or how to fully engage with her. Even though this was part of the mental health outreach work that I was involved in to isolated elders in the San Joaquin area of California per the Jesuit Volunteer Corps (JVC), I had not previously done a lot of visitations, either personally or professionally, with elders. Her semi-private room door was already ajar, so I gently knocked on it to alert her that I was coming in and said, "Is this a good time for a visit, Ms. Melissa," as I had been foretold by the charge nurse that she was someone identified who may possibly benefit from professional contact for depression and isolation. It sounded like Melissa had no local family contacts and was very limited in her mobility due to severe degenerative joint disease. As our eyes met when I went closer to her bed, she appeared very diminutive and emaciated yet manged to convey a cheerful smile as she softly spoke, "I'm here working on another treasure - come and see it." I stood right next to her and noticed how contorted her body was with pillows all around her hospital bed for cushioning and relief. My eyes were then immediately drawn to her hands that evidenced the twisted trauma of rheumatoid arthritis. Somehow, securely in place between her thumb and index finger was a crocheting needle affixed in some cloth material with a pattern for some design that she was working on. She proceeded to ask me the normal pleasantry question one does when meeting a new person for the first time: "Where are you from?" as she continued to work her crochet needle elegantly in a continuous fashion with her eyes fixed on some cloth that appeared to be a quilt being made. After I told her my name, my work role and that I was from New Orleans, there was a period of that silence that most of us know about - when you are uncomfortable about what to say next. Here I was, a social work apprentice remembering the dictum to "start where the client is," so I shut up and tried to use some listening skills that I supposedly had acquired in undergraduate studies. Over the next hour and following many of subsequent visits with Melissa, I learned much from and with her about what coping strategies can help elders and anyone in dealing with depression and isolation - intertwined with other "fabrics of life" lessons - not to mention learning how to crochet! Later, I certainly made brownie points with Maria from Melissa's beautiful crocheted birthday gift! I followed my JVC year by concentrating on gerontology within the Graduate School of Social Work at San Diego State University. It was neat how after my first year of graduate school, Maria and I were married and able to take a trip to the San Joaquin Valley to visit with Melissa, who had declined but was still crocheting. The gerontology section of the School of Social Work was the smallest of the four divisions, with only 10 students. The students in the other social work divisions seemed reluctant, even fearful of working with the elderly. They were preparing for the fields of mental health, children and families and hospital social work. They wondered aloud why I would consider working with "that group." I certainly shared with them some memories of lessons learned from Melissa and Lucille, a frail elder whom I was a care giver for in my first year of graduate school. My fellow grad students thought of working with the elderly as depressing; they were put off by the urine smells in nursing homes and by the death and dying. One student even shared a fear of "touching someone with wrinkles." These feelings were shared honestly, and my fellow students were better suited to work with struggling families and children or in hospital settings. I couldn't help but recall how touched I was by Melissa's rheumatoid hands and spirit! Aside from my time studying the biological, economic and psychological aspects of aging, my school experience taught me that too often old age is hidden not just from our eyes but even more from our feelings. We not only tend to deny the reality of old men and women living in closed rooms and nursing homes, but also, as Henri Nouwen noted, the old man or woman who is slowly awakening in each of us. Melissa certainly gave me an invaluable understanding far beyond book knowledge of aging, coping with losses and death and dying. Back at church, after Maria and I had finished giving out the mouth watering donuts with milk and orange juice intertwined with some great conversations, we folded the exquisite crocheted table cloth from Melissa and shared a prayer of thanksgiving for the living legacy of what Melissa had shared with us - the fabric of life!